One of the core components in Appery.io platform is a cloud build service which builds a binary file (hybrid) for iOS or Android. Appery.io leverages Apache Cordova (PhoneGap) to create a binary file. Launching the build process is very simple. Right from inside the App builder, clicking the Export button you will see the option to create a binary file for iOS or Android. Once Binary (.ipa) or Binary (.apk) is selected, the build process starts. The build process usually takes one minute. When the build is completed, the file is downloaded to your computer. From there you can publish the app to an app store, using the standard publishing process for each store. Learn more about how to use Apache Cordova in Appery.io to build hybrid apps and use native APIs. Every app created in Appery.io comes with Apache Cordova library installed. This means you have access to device APIs such as the Camera, Contacts, Geolocation and more. Now it’s also very simple to add any 3rd party Cordova plugin to your app. The Appery.io team introduced a new wizard that allows you to install any Cordova plugin. In addition to making it simple to install any Cordova plugin, there is a new visual service build for API Express to create custom services connected to enterprise data source. Plus, you can now drag and drop a service into AngularJS scope editor and the service invocation code will be automatically inserted. Learn more about this and more from the Appery.io blog. We know that developers love examples. 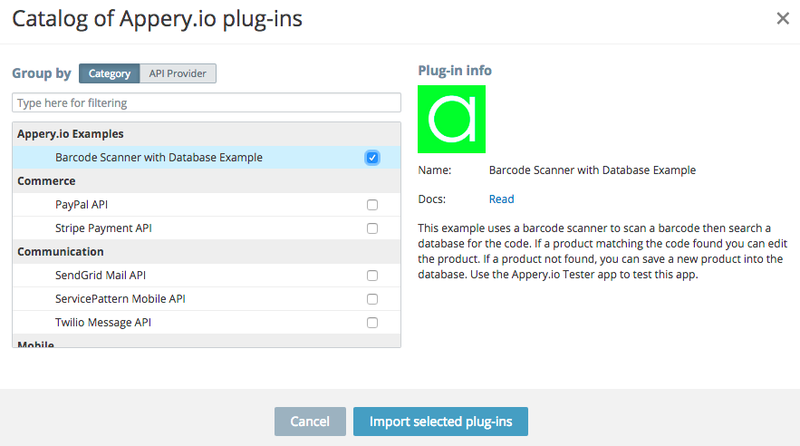 One of the most requested example is how to build an app with barcode scanner and search the database. We created an app example that does exactly that. This example shows how to use the barcode scanner to scan a product then search the database for that code. If a product is found, then you can edit the product (name, quantity). If the product is not found in the database, you can add the product to the database. This video shows how to build a mobile app with Geolocation and display the location on Goole Maps in 5 minutes. Check out other videos in Build in 5 Minutes series. Check out many other videos on Appery.io YouTube channel. What is the Difference Between Appery.io and PhoneGap? A common question we get asked is: “What is the difference between Appery.io and PhoneGap?”. The simple answer is Appery.io platform uses PhoneGap (actually Apache Cordova). But let’s look into this more. It allows to package an HTML/JS app as hybrid mobile app. Basically you run HTML/JS app inside a native wrapper (hybrid app) but it basically looks and behaves like a native app. This allows you to target multiple mobile platforms using a single code base. PhoneGap is owned by Adobe and the name it uses for the product. Adobe acquired Nitobi in 200x the maker of PhoneGap and donated the library source to Apache under the name of Apache Cordova. PhoneGap today is Adobe’s product that consists of Cordova plus some extra features around the framework (to make it a product and brand name). Even thought most people use the names PhoneGap and Cordova interchangeably, Appery.io bundles Cordova in every app. All these features and more are provided by Appery.io. Cordova is just a component within Appery.io platform which enables to build hybrid apps. Appery.io and Cordova don’t complete but compliment each other.